Parking and traffic concerns about a planned 55-foot-tall building with 31 residential units and 5,000-square feet of commercial space were expressed at a Nov. 19 community meeting hosted by Alderman John Arena (45th). While the project was well received, several residents said that the planned nine parking spaces were not enough, and some expressed concerns that the development would worsen traffic congestion. 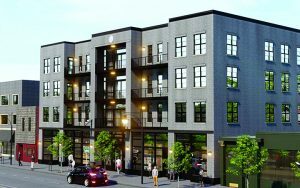 The project is exempt from the normal one parking space for each unit requirement due to its proximity to the Jefferson Park CTA Transit Center, 4917 N. Milwaukee Ave.
"People are going to come here and have at least one car," said a Higgins Avenue resident who lives behind the site. "The parking on Higgins is impossible, (and) it’s getting out of hand, the traffic." The woman added that rush hour traffic on both Milwaukee Avenue and Gale Street, which runs between Higgins and Milwaukee, has become more congested in recent years. She said that many of the area’s newer families have multiple cars. A local real estate agent said that some of the parking concerns would be alleviated if the five-story building would be smaller. "That’s big," she said of the project’s density. Plans call for retail and office space on the ground floor, a total of 30 apartments on the second through fourth floors, and an owner-occupied penthouse and two roof decks on the fifth floor. The penthouse would be set back about 40 feet from the sidewalk so it would not be readily visible to passers-by. Project officials said that the five-story building would cater to professionals who could commute via the CTA Blue Line. Arena said that the project is one of several developments planned for sites near the transportation center and that prospective tenants with cars would most likely choose another building in the area which would better meet their parking needs. "In the area we have different metrics," he said. Arena has been a strong supporter of transit-oriented developments, which involve increased density near public transportation centers and lower parking requirements. Prospective tenants who require on-site parking may want to consider the four-story building with 39 apartments and 41 garage spaces under construction at 5201 W. Lawrence Ave., Arena said. Tenants will have to pay about $100 a month extra for a parking space, according to the project’s planned development ordinance. Other area projects include a 75-unit building with 40 parking spaces at 5150 N. Northwest Hwy. and a 48-unit complex with 50 parking spaces at 5342-52 W. Argyle St. A mixed-use development also may be in the works for the TCF Bank site at 4930 N. Milwaukee Ave., where bank officials have said that a smaller branch would be part of a redevelopment project there. Meanwhile, it also was reported at the meeting that at Arena’s request the project’s developer has agreed to include six affordable housing units in the project. Only three are required under the zoning code. The affordable units would be offered at below-market rents to those families with household incomes of about 60 percent of the area’s median income. Arena has called for increased affordable housing requirements in Jefferson Park and Portage Park in an effort to curb the effects of gentrification, including higher housing costs. The 30 apartments would include a mix of one-, two- and three-bedroom units, including some with a balcony or terrace, according to project architect Laura Garcia. The site was once the home of Edward Fox Photography and Ernest Myer Interiors. Arena said that the projects planned for Downtown Jefferson Park would help raise the profile of a commercial district that for too long has been plagued with vacant lots. "This has defined Jefferson Park for decades, and it’s not a good definition," Arena said. After the meeting, Jefferson Park Neighborhood Association Zoning Committee chairman Ron Ernst said that the association is "totally against" the proposal and that the site should be redeveloped under the existing zoning, which would allow up to about a dozen units. The association has a policy of generally opposing up-zoning requests. THE RENDERING above shows a proposed 55-foot-tall building with 31 residential units and 5,000-square feet of commercial space across from the Jefferson Park CTA Terminal, 4917 N. Milwaukee Ave. The proposed building would sit on the former site of Edward Fox Photography and Ernest Myer Interiors. Even though the rendering shows a four-story building, an owner-occupied fifth floor penthouse is also planned. The penthouse would be set back 40 feet from the sidewalk and reportedly be not readily visible from the street, according to project officials.